Microsoft unveiled a pair of wireless desktop mice this week that mimic the design of the company’s popular line of notebook optical mice. The Wireless Laser Mouse 6000 is a full-sized mouse similar to the Wireless Notebook Optical Mouse 3000 aimed at laptop users. Like that latter mouse, the new 6000 features a snap-in transceiver, aimed at easier storage and mobility. The 2.4GHz RF transceiver, which plugs into a USB port, snaps into the bottom of the wireless mouse when not in use. Available in March, the $49.95 Wireless Laser Mouse 6000 features five buttons. One of the two buttons on the side activates Exposé by default for Mac users running OS X 10.3 and later; the other side button is a magnifier that enlarges text and images on the entire screen. 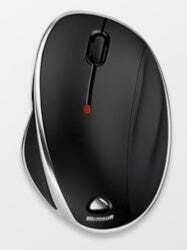 In addition, the mouse sports a scrolling click wheel that offers four-way scrolling. Microsoft says users can expect six months of power from two included AA batteries. Microsoft also announced a March release for the new Wireless Laser Mouse 7000. It’s also a five-button mouse with the same basic design as the 6000 model. However, the rechargeable 7000 model comes with both a charging station and 2.4GHz RF transceiver. Separating the two lets users unplug from the flat-charging station when the mouse is charged, saving desk space. Microsoft says the Wireless Mouse 7000 can go three weeks between charges. The Wireless Laser Mouse 7000 will sell for $69.95.